The very funny Fannie Flagg has had a long and interesting career. She worked as a staff writer for Candid Camera and was an actress on TV and film. You probably need to be at least my age to remember her witty participation on Match Game or anything else she was in, but you may remember the movie “Fried Green Tomatoes” starring Jessica Tandy, Kathy Bates, and Cicely Tyson, for which she received an Academy Award Nomination. In this book, her humor shines again. It is the story of spunky Elner Shimfissle, an elderly resident of Elmwood Springs. Elner will inspire you, challenge your complacency, and maybe even get you to think about heaven in a different way. Though not a religious book, Fannie pokes fun at religious people as only a person who is very familiar with that culture can. Elner falls off a ladder one morning while picking figs and has a near-death experience that ultimately affects the whole community with her hilarious experience. Fannie Flagg was once severely dyslexic. Now, she is just severely funny. Start chortling with your a summer-ready paperback copy from Inklings or your local independent bookstore. 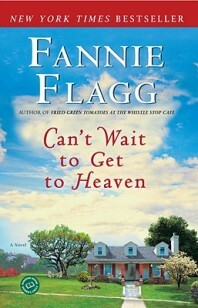 “Fannie Flagg was once severely dyslexic. Now, she is just severely funny.” Brilliant!